Presented Friday afternoon, November 9th, 2018, 3:00 – 3:15PM, Esquimalt Room 176th ASA Meeting, Victoria, B.C. The ocean is a natural acoustic waveguide, bounded by the sea surface and seabed, inside which sound can travel large distances. In the frequency range of 10’s – 1000’s of Hertz, seawater is nearly transparent to sound, absorbing only a small fraction of energy of the acoustic wave as it propagates in the ocean. However, sound transmitted in this shallow water ocean waveguide reflects off the bottom, losing some energy which is either transmitted into the bottom, or absorbed by the sediment. In order to predict and model the distances over which any acoustic ocean monitoring, detection, or communication systems may operate, accurate knowledge of the acoustic properties (the sound speed, attenuation, and density) of the seabed must be known. The majority of the ocean’s bottom has a top layer of sand or gravel, where the grain sizes are large enough that gravity and friction dictate the micro-physics at inter-granular contacts and play a large roll in determining the sound speed and attenuation in the material. In silts and clays (a.k.a. muds), grain sizes are on the order of microns or less, so electrochemical forces become the dominant factor responsible for the mechanics of the medium. Mud particles are usually elongated, with high length-to-width ratios, and when consolidated they form stacks of parallel grains and ‘card-house’ structures, giving the ensemble mechanical and acoustical properties unlike larger grained sands. In March and April 2017, as part of the ONR-supported Seabed Characterization Experiment (SCE) designed to investigate the geo-acoustic properties of fine-grained sediments, a bottom lander known as Deep Sound was deployed on the New England Mud Patch (NEMP) from the R/V Neil Armstrong. The NEMP occupies an area of approximately 13,000 km2 off the east coast of the USA, 95 km south of Martha’s Vineyard, and is 170 km wide, descending 75 km across the continental shelf with an unusually smooth bathymetry. The region is characterized by a layer of mud, accumulated over the last 10,000 years, estimated to be as thick as 13 meters . The American naturalist Louis François de Pourtalès first described this ocean feature in 1872 , in the context of a convenient navigation aid for whaling ships headed into Nantucket and New Bedford. Sailors would make depth soundings using a lead weight with a plug of wax on the bottom which collected a small sample of the seabed. Since the mud bottom was unique along the New England seaboard, ships were able to determine their location in relation to their home ports in foggy weather. Deep Sound (Fig. 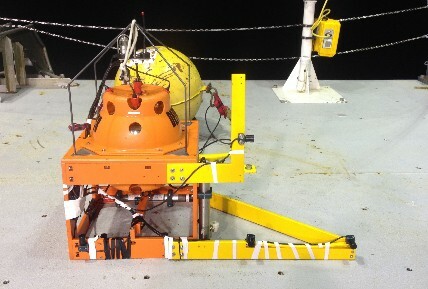 1) is a free-falling (untethered), four channel acoustic recorder designed to descend from the ocean’s surface to a pre-assigned depth, or until pre-assigned conditions are met, at which point it drops an iron weight and returns to the surface under its own buoyancy with a speed of ~0.5 m/s in either direction. In this case, the instrument was configured to land on the seabed, with the hydrophones arranged in an inverted ‘T’ shape, and continue recording until either a timer expired, or a battery charge threshold was crossed. Almost 30 hours of ambient noise data were collected at five locations on the NEMP, shown in Fig. 2. From the vertical coherence of the ambient noise, information about the geo-acoustic properties of the seabed was extracted by fitting the data to a model of ocean noise, based on an infinite sheet of sources, representing the bubbles generated by breaking ocean surface waves. The inversion returned estimates of five geo-acoustic properties of the bottom: the sound speed and attenuation, the shear-wave speed and attenuation, and the density of the muddy seabed. Bothner, M. H., Spiker, E. C., Johnson, P. P., Rendigs, R. R., Aruscavage, P. J. (1981). 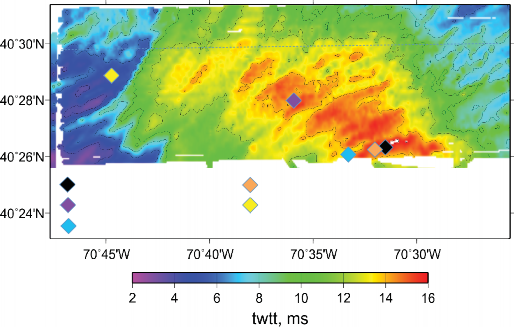 Geochemical evidence for modern sediment accumulation on the continental shelf off southern New England. Journal of Sedimentary Research, 51(1), pp. 281-292. Pourtales, L.F., (1872). The characteristics of the Atlantic sea bottom off the coast of the United States: Report, Superintendent U.S. Coast Survey for 1869, Appendix 11, pp. 220-225. Carbone, N. M., Deane, G. B., Buckingham, M. J., (1998). Estimating the compressional and shear wave speeds of a shallow water seabed from the vertical coherence of ambient noise in the water column. The Journal of the Acoustical Society of America, 103(2), pp. 801-813.